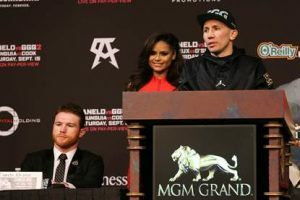 Still No Face-Off For Canelo and GGG; Is the Face-Off More Important to the Fans than the Fighters? On Friday afternoon, Canelo Alvarez and Gennady Golovkin meet for the final time ahead of Saturday night’s rematch to weigh-in and potentially face-off. Emphasis on “potentially” since that one element of the pre-fight build-up has been completely absent since the fight announcement. How important is the face-off to the fighters themselves? Is it just an element for fans and hyping the fight? Or is it a legitimate part of the preparation ahead of fight night. We asked a number of current fighters and trainers if the lack of face-offs in the promotion of Canelo vs. GGG rematch is helpful or detrimental to the promotion of the event and their overall mental preparation for the showdown. Here’s what they had to say. I always wanted to face-off with an opponent because I always had something to leave on his mind when he went back to his room. It was part of my strategy and also letting him know I’m in your head, I know I’m in your head and we gonna fight when we fight. It really doesn’t matter in my opinion. There’s a lot of bad blood there, I can’t blame GGG. He feels Canelo cheated. I really don’t know their reason for not doing but me personally, I don’t mind facing off at any given time honestly. It doesn’t matter, but in GGG eyes he’s waiting for when it’s a great time! He wants to see the fear in Canelo’s eyes. I consider GGG an “American psycho” or a Dr. Jekyll and Mr. Hyde split personality. He looks nice and wholesome, but he has a crazy killer inside him. It really doesn’t matter because come Saturday, they’re going to fight. Why would I care? I don’t give a f**k about Golden Boy. Doesn’t matter. He’s been doing this far too long. Face-Off. Weigh-In. Press conference, none of that stuff is a big deal for a big-time athlete. Face-off is for the crowd. I think it’s bad because if there is that much bad blood, then as far as fight pub goes there isn’t anything more golden! As a fighter, if I don’t like my opponent then I can’t wait to see him and make him uncomfortable.